CicLAvia is hosting its third 2017 event on Sunday, and this time they&apos;re entering new territory: San Pedro and Wilmington. The waterfront route follows earlier 2017 events in Culver City and Atwater Village before its final event of the year happens in October, which will follow its original route downtown. The event started at 9 a.m. and goes until 4 p.m. It goes through an area meant for foot traffic and tourism, so cyclists can visit the Battleship USS Iowa or hop on the L.A. Waterfront Trolley. The Port of L.A. also unveiled its Metro bike share program, making CicLAvia the perfect opportunity to try out the new public bikes. Four activity hubs along the route also feature a breastfeeding station, a chance to sign up for an LAPL card (perfect for accessing the Criterion Collection), and get food at various food trucks. CicLAvia is in its seventh year and has established itself as a full L.A. institution, bringing out thousands of cyclists for each day-long bike ride. The pedestrian and bicycle-friendly event has support from Mayor Eric Garcetti himself—probably because it falls in line with his Vision Zero efforts to improve pedestrian safety and the event regularly collaborates with Metro (public transportation improvement is one of his main goals as Mayor). Los Angeles County Supervisor Janice Hahn (whose Twitter handle doubles as the phrase &apos;sup, Janice Hahn) also showed up for today&apos;s ride. 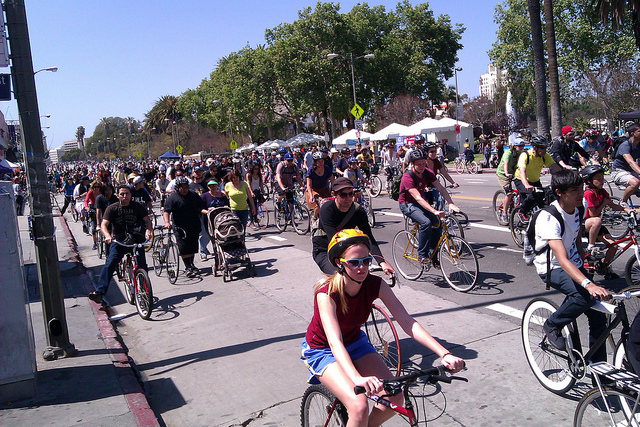 Great turnout today in #SanPedro and #Wilmington for the #CicLAvia. We #standagainsthate by bringing the community together.